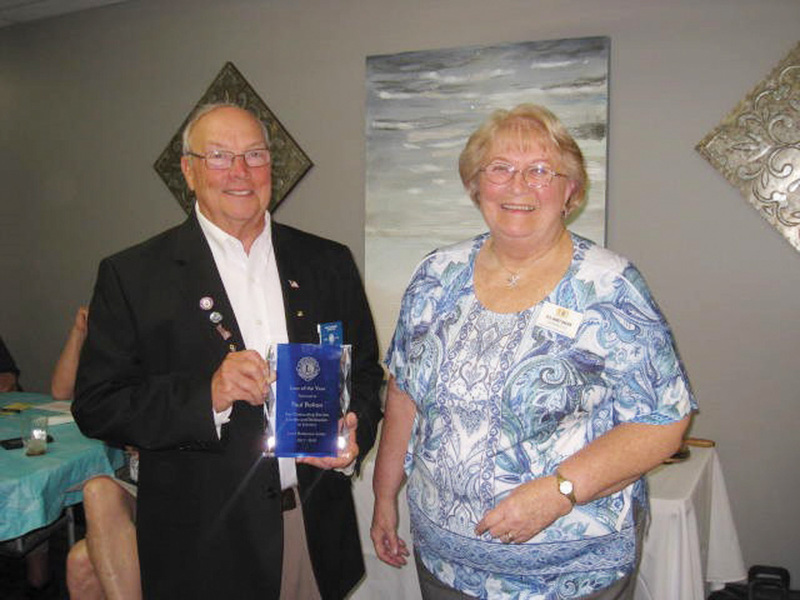 Lion Paul Bolton, left, holds the award after the presentation from Lions President Janet Bauer, right. At the Lord Baltimore Lions Club’s July meeting, Lions President Janet Bauer recognized Paul Bolton as the LBLC Lion of the Year 2018. Bolton — an 18-year Lion — has been a member of the Lord Baltimore Lions for four years but had previously served as a member of the Olney Lions Club in Maryland since 2000. During his four years with the Lord Baltimore Lions Club, he has served as a member of the Board of Directors and contributed to major LBLC club initiatives in all five service areas: Vision, Youth, Diabetes Awareness, Hunger and the Environment. “Paul has brought a number of community needs to the attention of the Lions and he has been a club leader,” the group noted. On March 12, 2018, he organized a community wide Drug Use Disorder Awareness Discussion Panel to bring forth information on how the opioid crisis and drug abuse is impacting local communities. He invited speakers from all areas to articulate the current issues and to provide solutions on how to combat the epidemic. Since the first LBLC Lion of the Year Award was given to Lion Norm Justice in 1990, 21 Lord Baltimore Lions have received the award. For additional information on the Lord Baltimore Lions Club, visit the website at www.lordbaltimorelionsclub.com or call Lions President Janet Bauer at (302) 537-5175.